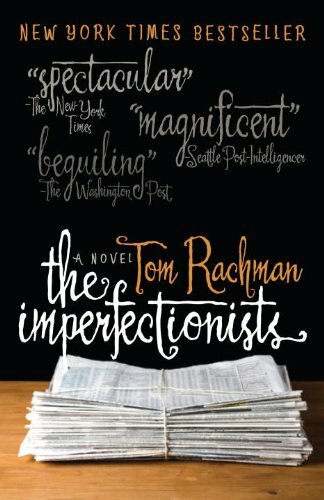 I'm happy to report that The Imperfectionists lives up to the many fine reviews it has received. It is both compelling (in that I didn't want to put it down) and a finely-tuned character(s) study. Based around an English-language newspaper published from Rome, each of the eleven chapters focuses on a different member of the staff (or, in one case, a devoted reader). Thus, the central character of an early chapter is a minor player in later chapters (or vice-versa), and all links together. It is not much of a spoiler, however, to note that The Imperfectionists is concerned more with character than plot - this isn't like, for instance, when Dickens tells his story through rotating perspectives in Bleak House (another recent read). Each chapter could stand as a discrete short story, although undoubtedly they gain more from recognising characters from earlier chapters. There is some plot, however: the paper (never named here), is, like all others really, in financial trouble. Begun in the 1950s by an American businessman for personal reasons, the paper's history is told in short sections at the end of each chapter, from its founding through its heyday in the 1980s and subsequent decline as a result of competition from the internet and other technological advances (a recurring point is that, by 2005, the paper still had no website). It should be noted that Rachman worked for a few years as an editor at the International Herald-Tribune, so he clearly knows the world of this paper well. The Roman setting is also used well - the fact that most of the paper's staff are ex-pat Americans living in Italy but still working in an English-speaking environment contributes to the isolation brought on by the fact that they are working at a dying instance of a dying medium. So while that theme plays through The Imperfectionists, the novel's real strength is the characters who populate it. Rachman paints all of them at least somewhat sympathetically (although some are more likeable than others). Most of the chapters end of a faint note of irresolution - not in an unsatisfying way, but emphasising that each chapter tells only a little slice of each person's life. I am a bit of a sucker for novels which alternate between different narrators/character POVs (purely off the top of my head, see most of David Mitchell's novels, or Paul Murray's Skippy Dies, but there are many more examples). It is, however, a hard trick to pull off - even aside from the question of which characters will provide the readers with their POV, the author has to balance all sorts of considerations like how often to switch, how various characters will be portrayed by the different narrators, how much the stories need to/should overlap, how best to represent the different voices of the characters etc etc. 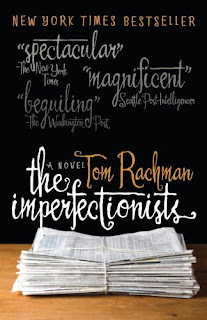 Part of the success of The Imperfectionists is that Rachman has done this perfectly - as I said, any part could stand alone, but each has also been composed with the others in mind, so that little pieces fall into place from earlier chapters, and also set up later developments. A lot of thought has clearly gone into the planning of this book - if done even slightly less well, the overall effect would be vastly reduced, I think. Anyway, now that I've added in my small way to the rave reviews for The Imperfectionists, all I can suggest is that you read it! Your review has made me really REALLY want to read this one, but...I've borrowed so many books from you which I've yet to read and return!